The Saab BioPower 100 Concept, first unveiled at the Geneva Auto Show last month, is making its North American debut at the Javits Convention Center in Manhattan, New York. "Saab is the sales leader in the "flex-fuel" car segment in Europe, and we are eager to extend that success to North America", said Jay Spenchian, Saab Automobile USA General Manager. "The BioPower 100 Concept shows the way to go. Beyond highlighting the first production-based turbo engine to be optimized for pure ethanol, this hi-tech concept also foreshadows the arrival of Saab BioPower products in the United States in the near future." The exciting BioPower 100 Concept brings Saab's technology to a new level by showing the true potential of combining turbocharging and sophisticated engine management with pure bioethanol fuel. It is one of the best examples that greener motoring can also mean even sportier driving. "This exciting concept shows the tremendous potential of bioethanol, in terms of both performance and future opportunities to 'rightsize' engines," says Saab Automobile Managing Director Jan ake Jonsson. "Bioethanol is already entering the market as E85 fuel and we look forward to seeing further supply infrastructure developments that will make it more widely available in the future." 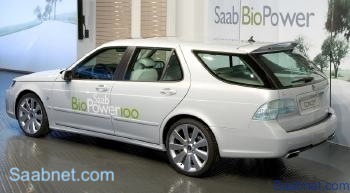 The Saab BioPower 100 Concept is presented as an evolution of the Saab 9-5 SportCombi. It is visually distinguished by styling features such as 'ice block' front and rear light units - extending a theme seen on the 9-3 SportCombi - and 19-inch 'turbine' alloy wheels inspired by those of the award-winning Saab Aero X concept, first shown at Geneva last year. The interior is upholstered in unique white leather, complemented by the main fascia and door trims, which are finished in black leather overlaid with a carbon fiber-effect pattern. The car is also equipped with Saab's innovative AlcoKey, an easy to use, pocket-sized alco-lock device that helps drivers steer clear of drinking and driving. Saab is already established as the leading player in Europe's emerging market for "flex-fuel" vehicles able to run on gasoline and/or bioethanol (E85). Its current Saab 9-5 BioPower model is the best-selling flex-fuel car in Sweden, a title which also extends to the European continent. At Geneva this year, Saab also announces BioPower's introduction throughout its 9-3 product range in Europe. So far, Saab BioPower development has been focused on using E85 fuel, (85 percent bioethanol/15 percent gasoline). Now, with the announcement of the fully functioning BioPower 100 Concept, Saab confirms its leadership position by showing how bioethanol technology could be further extended. In combining pure bioethanol with Saab's expertise in turbocharging, the BioPower 100 Concept offers drivers an exciting win/win proposition: greener motoring with dramatically enhanced power and performance. Running on E100, the concept car's engine delivers peak power of 300 hp at 5,800 rpm and an exceptionally strong 295 lb.-ft. of torque between 3,000 and 5,100 rpm, with almost 85 percent available at just 2,000 rpm. This strong and flexible power delivery gives the Saab BioPower 100 Concept car zero to 62 mph acceleration in just 6.6 seconds and 50 - 75 mph (fifth gear) in an even more impressive 8.2 seconds. The standard 150 hp gasoline engine produces 177 lb.-ft. of torque from 1,800-3,500 rpm, giving zero to 62 mph in 10.2 seconds and 50- 75 mph (fifth gear) in 16.3 seconds. The secret behind such enhanced performance is the ability of E100 fuel to resist harmful self-ignition, or 'knocking', as the fuel/air mixture is compressed in the cylinder. This attribute is denoted by E100's high 106 RON octane rating. It permits the use of an engine compression ratio that is higher than normally possible with turbocharging, giving more power and greater combustion efficiency without risk of knocking. The BioPower 100 Concept's engine operates with a compression ratio of 11.0:1, compared to 8.8:1 for the standard gasoline engine. This has been achieved by modifying the shape of the piston crowns to reduce the volume of the combustion chamber, thereby raising the engine's compression ratio. New software for Saab's powerful Trionic engine management system, which controls the throttle setting, ignition timing, fuel injection and turbo boost pressure, looks after the different ignition timing and fuel/air mixture requirements of E100 fuel. In ambient temperatures below 60oF, the chemistry of E100 makes it resistant to vaporization and, as a result, it can be difficult to start the engine. To overcome this issue, the Saab BioPower 100 Concept has an experimental fuel heating system, using small heating elements in the inlet ports downstream of the injectors. When the engine is cold, these elements warm the incoming fuel sufficiently to allow it to vaporize. Shortly after start-up, the function is automatically deactivated. On full throttle openings, the turbocharger packs up to 1.2 bar (17.4 psi) boost, without risk of 'knocking' from the high octane fuel. It gives the BioPower 100 Concept driver access to the sort of in-gear performance typical of a modern, naturally-aspirated engine of four liters or more. The smooth power delivery - without fossil fuel emissions - takes Saab's traditional 'less is more' turbo philosophy to a new level. That impressive 150 hp/liter specific power output also indicates considerable potential for engine 'rightsizing', giving the driver the performance characteristics of a 'large' engine without incurring its additional weight, greater complexity or higher fuel consumption. In this way, E100 offers significant potential to reduce the displacement of an engine - thereby reducing fuel consumption - while still achieving a desired power level. While the BioPower 100 Concept is focused on performance, it still retains a 'flex-fuel' capability and the engine will also run on gasoline, or E85, although power levels are not so high. Trionic monitors fuel quality after every visit to the filling station and automatically makes any adjustments necessary for running on E100/E85 and/or gasoline in any combination. To handle the increased performance, the BioPower 100 show car is fitted with a limited-slip differential and larger front brake discs (13.6 inches) and calipers, while using the sport chassis settings of Saab 9-5 Aero SportCombi. It also has a dual pipe rear exhaust system, with tailpipes similar to those of the Aero X Concept. Bioethanol's simple, fixed chemical composition opens up new possibilities in engine management and control. It consists of just one hydrocarbon molecule, whereas retail gasoline is a cocktail of several hundred different hydrocarbons as well as additives to prevent engine deposits which may not be necessary with bioethanol. It is also biodegradable and will dissolve in water. Saab's experimental variable compression (SVC) engine, revealed at Geneva in 2000, has played an important role as a test bed for BioPower development work. It has been used to help determine the optimum relationship between compression ratio and boost pressure for the BioPower 100 application. "Bioethanol is a potent, high quality fuel which opens up exciting possibilities in helping to meet the environmental challenges that face us," says Kjell ac Bergstrom, GM Powertrain - Sweden president and CEO, who has led the Saab BioPower 100 engine development team. He adds: "As the need to reduce energy consumption increases, we are exploring ways to run smaller engines that give relatively high power, with and without hybrid technology. Bioethanol can play a key role in this 'rightsizing' process, while also minimizing fossil fuel emissions." Saab is a division of General Motors Corp. Saab Automobile USA is the importer and/or distributor of Saab 9-3, 9-5 and 9-7X automobiles for Saab Automobile AB, Sweden. For the 2007 model year, Saab markets seven engines/transmissions that perform at an EPA-rated 30 mpg on the highway. Saab also offers vehicle warranty coverage for five-years or up to 100,000 miles. Visit www.saabusa.com for more information. Bioethanol fuel is produced commercially from agricultural crops, such as corn and sugar cane, and other forms of biomass. Also under development are second-generation processes which offer greater energy efficiency by using ligno-cellulose extracted from forestry and agricultural products, such as wood, straw and grass. Unlike gasoline, bioethanol consumption does not raise atmospheric levels of carbon dioxide (CO2), the main 'greenhouse' gas. This is because emissions during driving are balanced by the amount of CO2 that is removed from the atmosphere when crops for conversion are grown. In contrast, fossil-based fuels, such as gasoline and diesel, release new amounts of CO2 into the atmosphere which have been locked away underground in oil deposits.